Expanded coverage of the horses to watch list (H2W) provided more winners and great prices for most, as well as we faired better with our choices in the early stakes season action at the Meadowlands. We scored in the best paying of three Clyde Hirt leg winners with Cee Pee Panic at $15.40. And we scored with the lowest price, the prohibitive choice Holdingallthecards at $2.40. We offered a triple combo but went two out of three as Ethan Hanover finished second for a $7.40 exacta (Who Dat Love, our other exotic choice, was fifth). The other “Hirt” chapter saw us finish second with Mr Dennis at 8-1. There was no beating the choice in the Presidential leg, as we expected, so Golden Receiver presented a $3.00 win mutuel. We could not catch the exotics with him, as Dial Or No Dial finished fourth and Mr Hasani N was fifth. It was the best week the H2W presented thus far, not just in the raw number of winners but in prices. Four horses that won at 10-1 or better were listed. On Jan. 17, driver Ron Pierce won seven races in the Dover Downs program. However, with only one price in the double digits, and that only at 4-1, Pierce fans won only a few dollars from his spree. Pierce lost on the horses he drove with the longer odds that day and although he was a modest flat-bet profit, wagering on him solely due to his presence is not a smart idea. Speaking of drivers, Matt Kakaley began the 2013 season at Yonkers with a blast. Working for trainer Ron Burke, Kakaley, formerly a mainstay in Ohio, Matt won 10 of his first 39 drives, taking the lead in the standings over Brian Sears, who recently made his headquarters at the New York oval over regular appearances at the new Meadowlands. Kakaley is the youngest driver ever to reach the 2,000-win plateau. He is 23. The 2013 stake schedules for Illinois harness tracks Balmoral and Maywood have been released by racing secretary Doc Narotsky. Upstate mile Balmoral begins its high-profile affairs on March 30 with the Taurus Bomber Stake for Illinois conceived and foaled (ICF) three-year-old pacing colts. Maywood’s stake season starts April 12 with soph-pacing colts in the Sportsmaster Stake. The first major state-bred stake of the season is May 19’s race for three-year-old pacing fillies, the $45,000 Violet Stake at Balmoral. 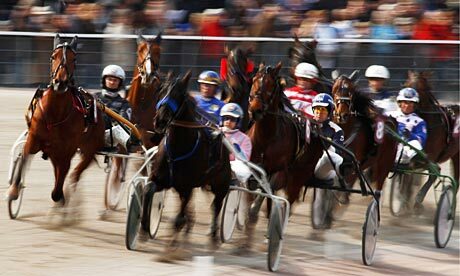 There will also be Violet and Cardinal stakes for ICF pacers and trotters on May 26, May 29 and June 1 at Balmoral. Maywood’s first big event will be the $100,000 Filly Maywood Pace for ICF three-year-old fillies on June 14. The $100,000 Maywood Pace for ICF soph-pacing colts will be held June 21. The first Hanover Stakes of the season at Balmoral will feature a trio of events for three-year-old trotters and three-year-old filly pacers on July 13. The Southland Festival of Racing will provide plenty of state-bred action at Balmoral on July 27, July 28 and July 31 with pacers and trotters in $50,000 battles like the Mini Me Stake, Loyal Opposition Stake, Incredible Finale Stake, Ann Vonian Stake, Kadabra Stake, Fox Valley Evita Stake, Fox Valley Flan Stake and Plesac Stake. A pair of $50,000 Hanovers for two-year-old colt and filly pacers are scheduled for Aug. 3 at the upstate oval. Balmoral will also play host to Illinois’ biggest night of racing, Super Night, on Sept. 14 for more than $1 million in purses. The American Nationals kick off on Sept. 18 with a pair of $90,000 trotting stakes for two-year-olds. October promises to be a busy month for youngsters as the $100,000 Lady Lincoln Stake for two-year-old trotting fillies takes place on Oct. 2 while their male counterparts battle in the $100,000 Lincoln Land Stake on Oct. 6 at Balmoral. Maywood will also host the $60,000 Cardinal and Violet Stakes for two-year-old colt and filly pacers on Oct. 4. A pair of $60,000 Hanovers for two-year-old trotters are also slated for Oct. 13 at Balmoral. Saturday, Nov. 9 and Friday, Nov. 15 the Grand Circuit action comes to town. Balmoral will play host to the $250,000 three-year-old colt pace, $225,00 American National three-year-old colt trot, $200,000 American National Aged Pace, $180,000 aged trot, $175,000 American National three-year-old filly pace, $150,000 three-year-old filly trot, $125,000 two-year-old colt pace and $125,000 two-year-old filly pace on Nov. 9. Maywood’s biggest card of the season is Nov. 15 with the $225,000 Windy City Pace for three-year-old pacing colts, the $130,000 Abe Lincoln Stake for two-year-old pacing colts, the $120,00 Galt Trot for three-year-old trotting colts and the $100,000 Cinderella Stake for three-year-old pacing fillies sharing the spotlight. The $30,000 Associates-McKeever Stake for ICF pacers is also scheduled for that same night. Indulge in many standardbred topics at my Hoof Beats blog titled Vast Performances. Every weekend as part of that blog we we offer Balmoral Pick-4-and-win picks at the USTA’s Strategic Wagering Program page which includes suggested win bets. On Saturday, our first-leg single, Allamerican Solo, won and paid $16.80.